To apply, email CV to no@dontdoit.com If you have a positive attitude and the ability to talk to people we have Customer Service opportunities to join one of the regions leading employers in a customer service/sales role where you can really shine. In this thrilling, fast paced environment advisers will be answering inbound customer enquires around a range of products and services. Each candidate must: Have an excellent telephone manner. Be personable and customer focused. Have a desire to work in a fast paced call centre environment. Have the ability to complaint/object ion handle. Work within and adhere to policies and procedures. These positions are to start ASAP. Now, forgive me my cynicism, but thrilling…. Is this the very same adjective which the Cambridge dictionary online defines as ‘extremely exciting’, or the Oxford dictionary refers to as meaning “causing excitement and pleasure; exhilarating”? Maybe I was in the wrong call centre, or perhaps being sat immobile for eight hours a day at a desk, plugged into a telephone and under strict orders not to move unless an emergency whilst being screamed at and insulted by irate customers is actually thrilling. I however, remain to be convinced. As for being ‘customer focused’, Really? Don’t make me giggle. Customer service/sales means the customer phones for the service, but gets the hard sell, not necessarily what they want, but what the company wants. Maybe I am being unfair though and maybe this place is different, maybe it is a fantastic place to work where the customer service is the number one priority over and above things like average call-times and maybe it is actually thrilling, but hang on…. These positions are to start ASAP. A huge thank you to everyone who has so far contributed to the Call Centre interviews. I Have just added three new interviews which can be seen along with the others here. unfortunately It’s too easy for a company to outsource and forget about the people taking calls. Why should they care, they paid some other company to care and that company only cares about the bottom line. I know that companies have to care about the bottom line but does it have to be set so low? I assisted a small-time Aussie “celebrity” apply for credit, and she was declined. Her reaction of ‘Dont you know who I am?’ was pretty priceless! Is working in a call-centre worthwhile? Now for something topical. Causing much excitement in the news today has been the results from the Office for National Statistics research on the nations well being. Here we take a quick look at what it reveals about the soul of the call centre. Of those people who are in employment, the type of occupation people have appears to have an effect on people’s subjective well-being ratings. 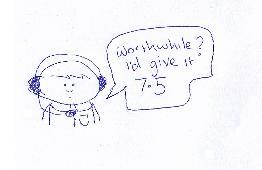 So, can we ask, is working in a call-centre worthwhile? Though the ONS data do not specifically refer to call-centre’s call-centre agents are themselves included within the occupational classification category ‘sales and customer service occupations’ along with telesales workers and shop assistants. It’s perhaps unsurprising that people in caring occupations, people whose day job is helping others, report that they feel the things they do are worthwhile, but isn’t that what customer service is about too – helping people – So why are call centre workers among the bottom group? The customer service ethos is one which is about helping people, but I can’t help thinking this has a hollow ring to it – after all it’s not like we’re helping people to do anything more worthwhile than flex their consumerist muscles as opposed to helping people in some more fundamental way. This game utilizes both the telephones hold button and an agents fine-tuned judgement, and though it comes from a work of fiction, the book eight minutes idle, the writer Matt Thorne himself worked in a call centre so it’s not beyond the realms of possibility that this game was once played for real. Keeping callers on hold is a fun game, if a hard one to judge. The temptation is to hang on as long as possible, but then if they hang up you lose all your points, and as we’ve got an open-ended competition running between our team, it’s sometimes safer to settle for a run of small scores. Ade has the record for longest single hold (43 minutes 18 seconds), but in the overall competition I’m leading with an accumulative score of nearly two hours. This game comes courtesy of JL who was one of the interviewees for the call centre interview series. The object is to write a word down on paper and then “sneak” that word into the conversation without raising the customers suspicions. To make this into more of an Olympic style event the rules have been codified to include a points system with the most challenging words attracting the highest number of points. 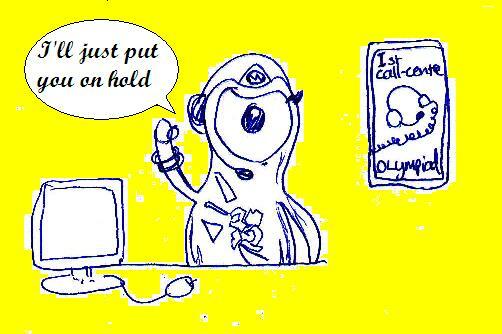 This is my personal addition to the call centre Olympics. The mute button hold is loosely related to call-centre hold-em, but has a number of key differences with the main difference being that in the mute game you simply take the call with your mute button on. The challenge is then to hold-out for as long as possible without being noticed by management. It is a test of nerve. The prize for winning is 10-15 seconds breathing space and an improvement to you call average for the day. On the other hand losing can mean your averages go up as the mute time is added to your call handling time. Again for the Olympics a few rule changes are needed. The format for this will be a knockout with agents facing-off against each other. Both answer on mute with the winner being the agent who holds out the longest. Bouts can also be won by achieving a hang-up.